Once completed, the World Trade Center complex will include five skyscrapers which will create a frame around the 9/11 Memorial, opened in 2011. 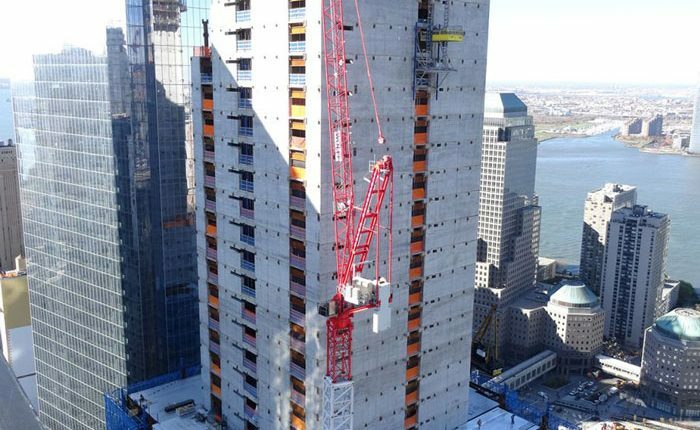 This summer, Federated Crane Co. set up a Wolff 700 B US at Three World Trade Center (3 WTC) for a steel construction company. The luffing crane is the first Wolff model in New York City. Construction work on the 3 WTC started back in 2010 with foundation work and a reinforced concrete inner core to accommodate elevators, staircases, and supply lines. The Wolff luffer, equipped with a 180-ft. jib and an additional 16- ft. fly-jib, is expected to be in use until mid-2016, lifting steel columns and girders for the outer shell of the skyscraper. Although this high-rise project entails standard construction methods the Wolffkran team faced the challenge of having to position the crane close to the structure’s inner core. With the construction of the core several floors higher up than the outer shell, a crane with a very small tail swing was required so it could rotate freely. The Wolff 700 B US, already equipped with a very short counter jib, was equipped with a counter jib of 24’ 3”. The Wolff will rise with the building to a height of approx. 980 ft. via an internal climbing mechanism. In addition to its compact construction, the customer opted for the Wolff 700 B US because its electric drives paired with high lifting capacities and working speeds. With recent stricter safety and efficiency regulations for cranes working in New York City, contractors and rental companies are more often opting for modern electric tower cranes rather than the conventional diesel-powered cranes. With a lifting capacity of 116,845 lbs. and a line speed of up to 623 fpm, it is ideally suited for the 3 WTC jobsite, where it has to lift tons of steel and prefabricated components up to 1,150 ft. high. It is further equipped with a fly-jib lifting 17,637 lbs. and a working speed of up to 459 fpm. With another Wolff 700 B US at work in San Francisco, the manufacturer has sent a new line of electric luffing-jib cranes onto U.S. building sites. Customer service, technical support, and spare parts are provided by the recently-established subsidiary Wolffkran Inc., operating just outside Manhattan. Now that the first two Wolffs have begun to prove themselves on U.S. turf, several Wolff 355 B luffing cranes are next in line to be used for upcoming projects in the New York metropolitan area, according to the manufacturer.